Building Information Modeling (BIM) is changing the way projects are constructed. Whether you are a prime contractor using BIM across an entire project or a subcontractor impacted by a specific BIM implementation, this emerging practice requires new mindsets and technological know-how in order to achieve significant improvements in efficiency and cost control. AGC's BIM Education Program — developed in conjunction with leading BIM practitioners, technology firms, and educators—is designed to prepare construction professionals at all experience levels to successfully implement BIM on a construction project. To register for the BIM courses and CM-BIM exam, please follow the steps below. 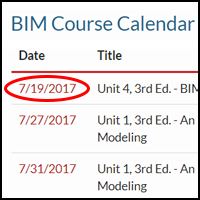 After navigating to the BIM Course Calendar (link is external) find an upcoming course and click on the date to view the class details. Register directly with the AGC chapter for your courses. If you cannot locate a BIM course in your state, we recommend contacting your local AGC chapter using the Chapter Finder, and request the course be scheduled in the future. If you have a large group to train, you can bring the courses in-house to your organization. Click here to see how you can bring AGC’s BIM Education Program to your organization. The highly interactive program provides 32-hours of instruction and training to get construction industry professionals at all levels ready to take advantage of the benefits of BIM. Click on the links below to learn more about each unit. Session 1 focuses on explaining common terms and answering the question “What is BIM?” This session also addresses why BIM should be used on construction projects and describes the potential benefits that can be realized by designers, contractors, subcontractors, vendors and owners when BIM is used. Session 2 examines the process that a company typically goes through to start incorporating BIM into its business practices. This session looks at how technology is helping to facilitate the elimination of work silos, describes the advantages of the BIM process and shares some of the workflow processes associated with BIM. Session 3 introduces some of the more advanced uses of BIM, following the typical progression a company goes through in its BIM implementation plan. This session examines case studies of 4D and 5D BIM and describes new topics that are impacting BIM today. Session 4 is where all the BIM concepts come together and you start thinking about the next steps. This session describes the four options for BIM implementation. Attendees will develop a BIM assessment survey that they can take back to their organization. Recognize the importance of BIM. Discuss how BIM can be used as a communication and collaboration tool. Explain the benefits of BIM. Explain the federated model process. Compare examples of successful BIM usage. Discuss issues associated with starting BIM. Create a company BIM assessment. Session 1 focuses on giving participants an overview of BIM technologies and the definitions that will be used throughout the course. It looks at tool classes and functions, which are instrumental in developing an understanding of the primary use for any application. Session 2 takes a comprehensive look at a range of products, organized in a logical workflow for a BIM project. This is the core of the course, and there is a lot of ground to cover. The focus is that tools need to fi t the process, not the other way around. Session 3 defines a four-step process of software selection that participants can use as they start purchasing BIM software applications. Session 4 explores some of the more granular details of BIM. The session briefly explores the topic of fi le formats, from the perspective of open versus proprietary, then from the perspective of interoperability. Explain the phased structure of a BIM project. Describe the classes of BIM tools. Describe how the use of BIM tools needs to be planned and organized. Explain the need to embed tools into the process. Session 1 introduces participants to teaming dynamics that are most desired, if not required, for a successful project. During this session, you will learn what qualities are necessary for a successful project team, the importance of establishing an environment of shared vision and accountability for each team member, to each other. We will also look at the impact of different size groups and how to adapt without compromising the project goals. Session 2 examines some of the more basic BIM-related legal concepts. We will focus on providing a fairly high-level perspective on a range of legal topics that attendees should know. These are general concepts that are evolving, along with BIM. We’ll look at risk, intellectual property and standard of care. All of these are good examples of real world concerns for everyone on the project. We will also examine the different delivery methods for construction projects, with time to discuss trends and benefits of particular models. Session 3 is all about gaining a strong understanding of the BIM Project Execution Plan (BIM PXP). We will look at the basic questions of what it is and why it is necessary, as well as how you can use the plan for any size project(s). We will spend quite a bit of time gaining a strong understanding of why this is such an important ingredient for a successful project. We will also look at some of the plans that are currently in use today. Session 4 is your time to participate in a BIM project team activity. You will be part of a team, with a defined role, and you will apply what you have learned in the course. The day will end with this activity with the goal that it will reinforce the information that was shared with you during the previous three sessions. Identify the key attributes of a successful team. Explain contract liability and model usage. Understand the meaning and usage of Level of Development (LOD). Explain the key components of a BIM Project Execution Plan. Understand and explain the benefits of a synchronized project workflow. BIM adoption, Implementation and ROI is the final of the four courses that comprise AGC’s Building Information Modeling Education Program. This full-day, facilitator-led course is a mix of lecture, facilitated discussion and activities and case studies. This 8 hour course reviews several real-world case studies to analyze the cost, benefits and impacts of decision making. Session 1 of this unit introduces the overall course structure and describes why this unit is so relevant today. This session defines key terms and sets the stage for the rest of the course, reinforcing the practical takeaways you will learn along the way. Session 2 examines basic BIM implementation at the project level. This session focuses on how to establish and execute the BIM process, facilitate its adoption, and achieve integration on a single project. Session 3 explores how companies (whether single- or multi- office) can successfully execute the BIM process on multiple projects simultaneously. We will also explore any differences in the adoption or integration of the process in this broader context. Define adoption, implementation and return on investment. Describe why BIM is a disruptive practice today. Identify reactive and proactive BIM outcomes. Evaluate and select process adoption options. Describe the roles and responsibilities of practitioners. Identify consistent factors influencing BIM ROI. Candidates who successfully complete the four AGC BIM Education Program courses and provide AGC with a record of completion are eligible to apply for the AGC Certificate of Management-Building Information Modeling (CM-BIM) Exam. This assessment-based certificate credential denotes knowledge and understanding of concepts related to BIM adoption, practice and process transformation outlined in the AGC BIM Education Program. 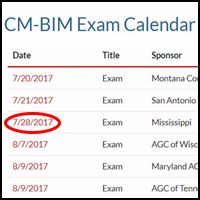 To begin the application process for the CM-BIM Exam, search for upcoming tests using the CM-BIM Exam Calendar. 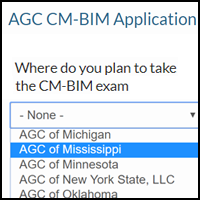 After accessing the CM-BIM Exam calendar look through the available exams to determine an exam location and date that best suits your needs. If there is not a testing date near you, you can still apply to your preferred testing center. Many locations will add exam dates as needed. You will have to complete the CM-BIM Exam Application in order to register for the exam. As you are filling out the form, be sure to select your preferred testing location from the dropdown list. You should not apply for your exam until you have completed all four classes. Use the map below to locate an AGC Testing Center. Click on your state in the map above to view the list of participating testing centers. Once you have located a testing center, complete the CM-BIM Exam Application and choose your preferred testing center. Note: If the map is green in your local state, there are no participating testing centers. 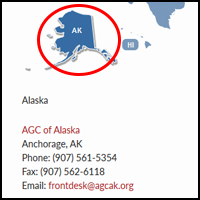 Participants may contact a representative at their nearest AGC chapter using the Chapter Finder, and request that the chapter becomes a testing center. 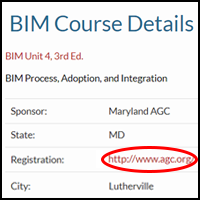 This optional two hour self-paced e-learning course reviews the principles of BIM as taught in AGC's BIM Education Program. The course is designed to supplement learner's review and study of the curriculum's four units as they prepare for the CM-BIM exam. Course participants can assess their understanding of Building Information Modeling as they experience the audio and visual content and answer the 46 review questions as they progress through the four units of the CM-BIM Exam Prep Course. This prep course is available in the AGC Store for $79 for members and $99 for nonmembers. Participants who successfully complete the BIM Education Program and pass the exam can be recognized for their accomplishment on the AGC CM-BIM Holders web directory. Further information on Certificate of Management- Building Information Modeling can be found on the CM-BIM webpage.